The NFL network is keeping up this fine tradition with the latest installment of its series "A Football Life" with an episode called “Cleveland ‘95." The one-hour program, airing tonight at 8, will take a retrospective look at the fiery trainwreck of a season that was the 1995 Bill Belichick-led Browns. Curious viewers can get a peek at the program's trailer (complete with a hideous sweater worn by noted Jon Bon Jovi confidante Belichick) on the NFL Films website. The show doesn't examine the sordid details behind Art Modell's decision to move the team to Baltimore. Rather, it focuses on Belichick's staff, a group that would one day become a who's who of all-star football executives and coaches. Among them are Ozzie Newsome, GM of the Baltimore Ravens; Thomas Dimitroff, GM of the Atlanta Falcons; and Nick Saban, head coach at University of Alabama. Of course, there's also the mandatory footage of The Move that took the team away from Cleveland. I was at Municipal Stadium on a December day in 1995 when the Browns beat the Bengals in what would be the last pro football game in Cleveland for four years. The last thing anybody cared about that strange day was the game. The atmosphere has been described as "funereal," and that's as apt an adjective as any. 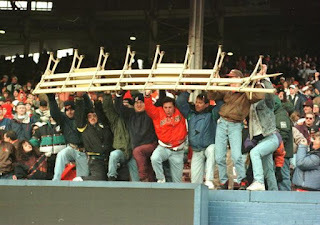 Instead of cheers, the banging of hammers and the harsh rasp of saws echoed through the stadium as fans ripped seats from their moorings to throw out on the field or take home as keepsakes. I still have a six-inch chunk of blue-painted wooden bleacher signed by Cleveland offensive lineman Steve Everitt, who gained fan adoration for eternity when he donned a Browns bandanna during the franchise's first season in Baltimore. The NFL Films special actually seems measured, thoughtful chronicle of those dark days. Why anyone would want to relive that pain is beyond reckoning. Newsome and others interviewed for the documentary contend that, given time, that Browns' team would have won the Super Bowl that went to the Ravens in 2000. Ooh, that's nice to hear, isn't it, Cleveland? Well, it's a debatable point for certain, but not one I want to ponder. Cleveland has a football team, sort of, one that's set to lose 10-plus games for the 11th time since 1999. Every defeat is a larger reminder of what was lost in 1995, so there's nothing for fans to do but look forward and leave the past where it is. However, "Cleveland '95" should be appointment viewing for new owner Jimmy Haslam. If Haslam wants to learn from Modell's mistakes and understand just what this football team means to generations of Cleveland fans, he must give the documentary a watch. He just shouldn't expect me to join him.